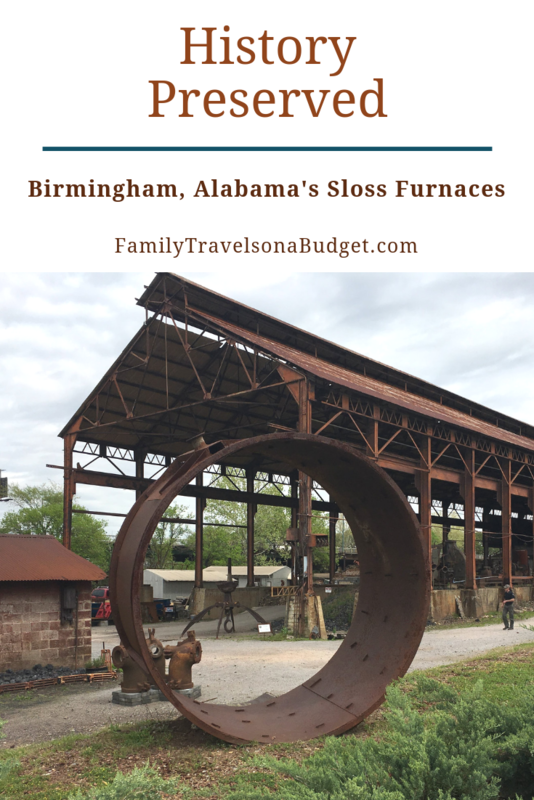 Many years ago, I drove by Sloss Furnaces in Birmingham for the first time. I thought it strange that this obviously abandoned factory would be left there for all to see — an eyesore to passersby and a strange way to make a first impression on people coming to this modern city now known as a hub of banking and medicine. This past summer, I finally decided to find out what that eyesore was all about. Why did Birmingham leave an abandoned factory alongside US Route 78 instead of reclaiming the property for a better use? Birmingham was founded in 1871, a merger of three small farm towns during Reconstruction at the “intersection” of two major railroad lines. Most of the early settlers here were of English descent, though Irish, Italian and African-Americans also settled here. The city was dubbed “The Magic City” because it seemed to grow from nothing almost overnight. The reality, though, is Birmingham is the only place in the United States to have all the elements needed for making steel — iron ore (which was mined at Birmingham’s Red Mountain), limestone (which is also abundant in the area) and coal (which was mined just north of the city). During the Industrial Revolution, that steel industry built the city of Birmingham — and the skyscrapers of New York. Southern states didn’t have the organized unions of the northern states, so making steel here was cheaper than in places like Pittsburgh. And so, the city of Birmingham grew. The term “pig iron” comes from early processing techniques. Workers poured hot ore from the blast furnace into long trays called runners. The ore ran from a main branch to smaller side branches. At some point, someone said the offshoots looked like piglets with a sow, and the name pig iron stuck. From 1882-1920s, Sloss Furnaces kept growing, expanding the blast furnaces to keep up with the demand created by the Industrial Revolution. The hardest and most dangerous work was done by the minority workers. As the work modernized, some of those tasks were mechanized, though still dangerous. The workers, especially from the 1880s to 1930s, were mostly new immigrants. They would be pushed to work long hours without breaks in dangerous circumstances. Many people died through the years because of burns or from succumbing to the poisonous gases that came from the furnaces. World War II led to increased demand for iron and steel, and by 1941, about half the people in Birmingham worked in steel and mining. Sadly, segregation played a role here — with African-Americans doing the dangerous, physical labor and white people in management roles. The company segregated more than labor, though, with separate bath houses, lodging areas, company picnics and even lunch areas. The furnaces, dangerous , ran non-stop right through 1970. 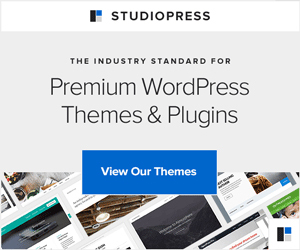 In 1971, Sloss Furnaces shut down abruptly. Environmental regulations that called to clean the air proved too expensive to upfit the furnaces, so they quit. Just like that! The workers lost their jobs. The factory lost its purpose. It sat there — abandoned — for years. And the people debated what to do with it. Should they tear it down to build a mall? Or housing? And who would pay for that? As the debate continued, a wise group of people pushed to save Sloss Furnaces. Today, Sloss Furnaces stands as a recognized historic landmark, telling the story of steel production in the south. It’s a proud reminder of Birmingham’s early days. When you visit, you’ll learn about the materials used to make steel, the process and the people who built the city. As you walk through the furnaces, try to imagine the heat, the noise and the danger those workers faced. It’s almost overwhelming. I love this aspect of Sloss Furnaces. This place was largely responsible for Birmingham becoming a major city in the south, and now, it’s helping Birmingham preserve the best of its past while also supporting future growth. One event, the “Just A Call Away 5K” helps raise funds to help those with mental health issues. Throughout the year, special events are held at the furnace in Birmingham. Learn the basics of metal arts at events all year long. SlossFest, technically the Sloss Music & Arts Festival, is a music festival weekend held each July at Sloss Furnaces. Weather has been a challenge, so I’m not sure the festival will continue here, but if it does, don’t dress up! Read here about SlossFest 2017. For SlossFest tickets or to see the SlossFest lineup for next year, click here. Every October, the property morphs for the thrills and chills of the Sloss Furnace Halloween. Considered one of the most haunted “houses” in Alabama — many workers died here — it’s probably not surprising that this place would give over to zombies at Halloween. Officially, this attraction is called Sloss Fright Furnace. Tickets are about $25 each, and include admission to the haunted furnaces, Outbreak 2 — where zombies have taken over the woods beyond the factory, Roadkill Cafe — which sells burgers, hot dogs, soda, beer and more, and Marathon of Horror — where horror films run continuously on the big screen outdoors. I know adults who think it’s too scary, but they say it’s a PG-13 type attraction! You can learn more about this haunted halloween attraction here. The museum and landmark is open Tuesday-Saturday from 10-4 and on Sunday from Noon-4. It is closed on Mondays and on certain holidays or in preparation for special events. Check the website for closures. 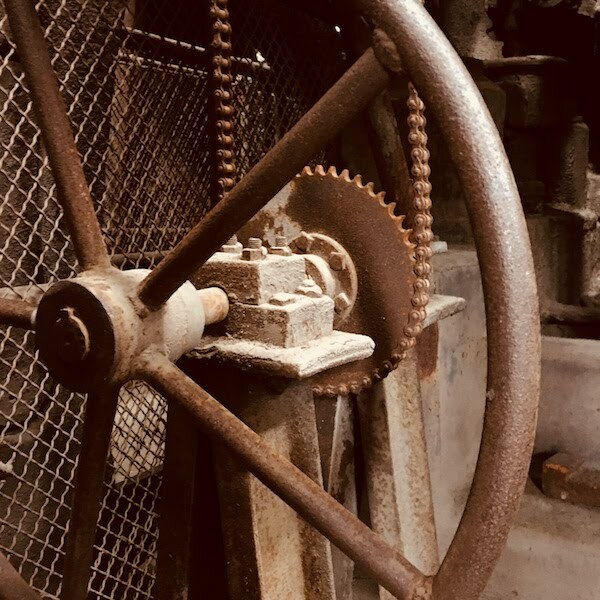 Start your visit in the Visitor Center where you can get your self-guided tour brochure, watch a short video on the history of Birmingham and Sloss Furnaces, and look at memorabilia collected from earlier days. When you visit do not climb on any structures and obey all rules for your safety. Built in the 1880s, this historic landmark is not wheelchair or stroller friendly. Though, the visitor center is accessible. Wear close toed shoes. The factory wasn’t clean — and the ground is not level. You’ll be walking on gravel, uneven stairs and in wet areas. Wear close toed shoes that offer good traction for your safety. If taking kids, watch the video with them before you visit. It will help them better understand what they’re about to see. Here’s the link to the video. 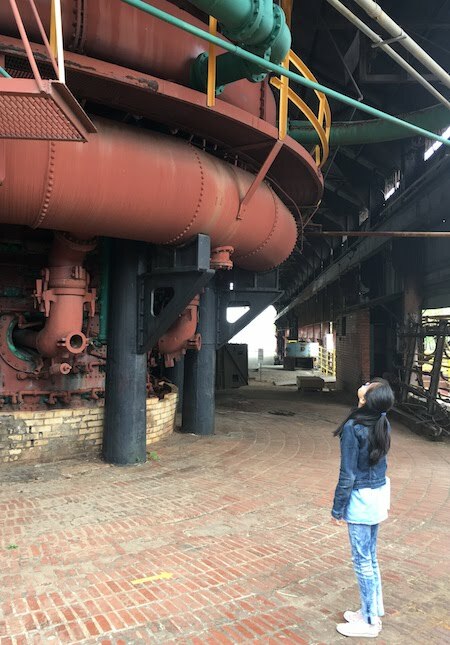 Allow 1-2 hours to visit the furnaces. You can take a self-guided tour during regular operating hours. Be sure to get a brochure that explains the factory as you go through it. On weekends and by special request, they offer guided tours as well. Other educational experiences are also available. Now that I have visited Sloss Furnaces, I am glad that people had the foresight to preserve this valuable piece of history. I better understand how Birmingham grew as a city — and the impact this factory, and city, had on the Industrial Revolution. Sadly, I also understand even more the deep hurt of discrimination in Birmingham in the 1960s. Science, history, politics — they all play a role in the story of Sloss Furnaces. I encourage you to visit and learn about it for yourself. Vulcan Park and Museum: Standing sentry over the city, Vulcan is a proud reminder to all who visit Birmingham how this city came to be. Vulcan Park is a great complement to Sloss Furnaces for even greater understanding of the impact of the steel industry on Birmingham. Red Mountain Park: Hike the trails at Red Mountain Park where iron ore was once mined to see relics of the mining days. At the end of the trail, enjoy amazing views of the city in the distance. 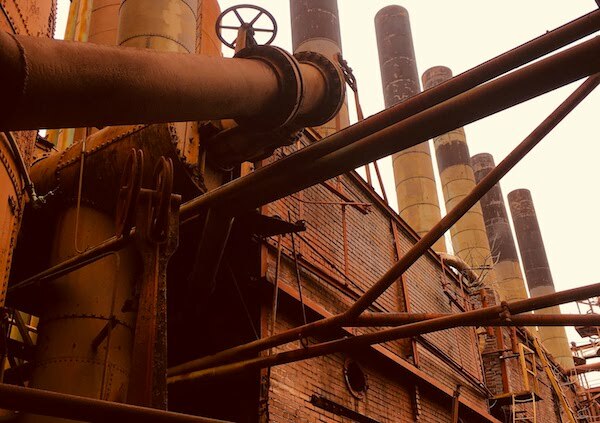 Birmingham Civil Rights Institute: Sloss Furnaces may have succeeded on the backs of African-Americans, but that’s a dark chapter the city doesn’t shy away from. Head to the Birmingham Civil Rights Institute to challenge your thoughts about our nation’s history — and the specific incidents that happened here. My heart broke at some of what I learned, but the museum experience ends with hope. Kelly Ingram Park: Across the street from Birmingham’s Civil Rights Institute, Kelly Ingram Park stands — a stark reminder to what happened here during the 1960s. Park installations tell the story, though it can be hard to face. Railroad Park: Downtown Birmingham is also a place of renewal. Railroad Park, which runs along the railroad tracks downtown, has become a gathering place for locals for concerts, recreational activities and playgrounds for the kids. It’s one of my favorite places in the city.